Drop your completed prescription in the box provided in reception. You may fax us at any time (day or night), see our contact page for fax numbers. If you’re collecting a prescription, don’t assume you can claim it for free. If you claim when you’re not entitled, even by mistake, you could face a penalty charge of up to £100. 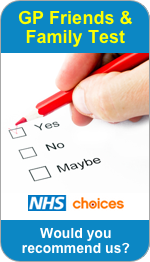 Ask your pharmacy team or find out more at nhs.uk/checkbeforeyoutick.